"The story of a rebel and his bike." Pee Wee's Big Adventure was the big breakout action comedy film of the beloved character Pee Wee Herman. Pee Wee is portrayed by his creator, Paul Reubens, who also co-wrote the script with Phil Hartman and Michael Varhol. This was the first feature film that was directed by Tim Burton. 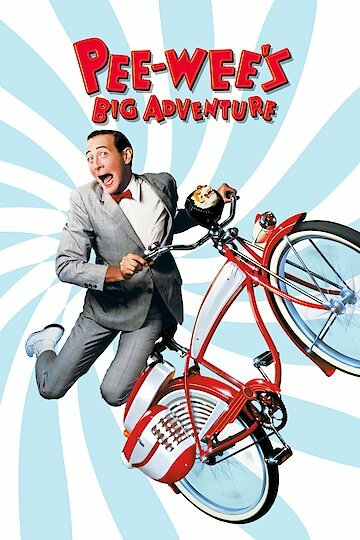 Pee Wee's Big Adventure tells the love story of a man and his bicycle. Pee Wee wakes up to a strange ritual every morning. He greets his pet dog, Speck, and is dressed and served breakfast by an elaborate animatronic butler. Then Pee Wee heads out to get his bike. Pee Wee clearly loves his bike, and he goes off to town to buy some new tricks at the magic shop and a brand new customized horn for his bike. Pee Wee has a secret admirer in bike-store employee Dottie. When Pee Wee returns to where he left his bike, he is horrified to see that it's been stolen. Despite support from his friends, Pee Wee begins to crack up. He is desperate with grief and sadness and turns to a psychic, Madame Ruby, to ask for help locating his bike. She turns out to be a fraud and tells Pee Wee that his bike is in the basement of the Alamo. That is when Pee Wee starts his big adventure. He sets out on a cross-country trip to find his bike. Along the way Pee Wee encounters dozens of crazy characters. He stumbles across a dinosaur-themed truck stop and meets a waitress who dreams of going to France. He hitches a ride from a ghostly trucker, Large Marge. He even gets a life from an escaped convict. When Pee Wee reaches the Alamo, he is saddened to find that the historic landmark doesn't have a basement. There is hope, though, as Pee Wee sees his bike in a television show on a Hollywood set. He sets out for California to rescue his precious bike. Pee-wee's Big Adventure is currently available to watch and stream, buy on demand at Vudu, FandangoNow, iTunes, YouTube VOD online. According to critics, it's so good, you'll want to marry it. "It" is the Pee-Wee Herman Show on Broadway which makes an HBO debut Saturday March 19. The live show reunites Paul Reubens (Pee-Wee) with the beloved Playhouse crew, including Miss Yvonne, Mailman Mike, Cowboy Curtis, Jambie the Genie, Pterri, Conky and Chairy. Like the Emmy-winning Saturday morning television show, the live production has been hailed as a similar phenomenon "where anything can happen.